In a standard printing environment, a user's jobs are sent directly to the printer for immediate printing. This results in wasted paper and toner when printing is forgotten and not collected. It also presents a security risk if those forgotten jobs were sensitive or confidential. PaperCut print release provides a simple solution that places jobs in a holding state until the user authenticates and releases the job at the printer. Users may select individual jobs to release or have jobs automatically print after successful authentication. Secure printing - sensitive jobs will not sit uncollected on the printer. Jobs only print when released by the user. Find-Me Printing - provides a roaming print solution where users print to a single queue and jobs will be "pulled" to any printer where they authenticate. Also known as "Pull Printing", jobs follow you to any printer. Reduced wastage - no more uncollected jobs. No wasted paper or toner. Charge to a shared account - printing without the PaperCut Client Tool? No worries. You can print from any BYOD or mobile device, and select your shared account at the same time you release your job. Last minute checks - make sure you print the right job the first time. Review, delete, print or edit multiple jobs in the print queue. PaperCut print release is a cost-effective and universal solution available for any printing device and is offered through embedded copier software, card readers or print release stations. PaperCut embedded software provides print release integrating directly with Multi-function printer (MFP) devices. This provides a seamless user experience as users login to the MFP using the LCD touchscreen or security card readers. Embedded solution is cost effective as no expensive 3rd party terminal hardware is required. Embedded software is available for the major MFP brands including: Ricoh, HP, Konica-Minolta, Xerox, Fuji Xerox, Toshiba, Kyocera, Sharp, Lexmark, and Canon. In addition to print release, these solutions also track and control copying, scanning and faxing. For devices that do not support an embedded software platform, similar features are available through third party hardware terminal devices connected to the MFPs. For more information on embedded solutions see the copier tracking solutions. The Fast Release TCP/IP Network Convertor is a cost-effective print release solution that leverages commodity of off-the-shelf USB card readers available from multiple manufacturers. The Fast Release Card Readers are connected to the network (not the printer) allowing them to be used with any printer on the market, and the desired USB card reader is attached to the Fast Release Card Reader. It's an ideal solution for printers that do not support embedded applications. The user prints to hold/release queue or a global virtual print queue, where jobs are held awaiting release. The user walks up to the printer and presents their identity card to the USB card reader attached to the Fast Release Terminal. Compatible USB Keyboards and PIN Pads can be used to enable user authentication via user ID number. 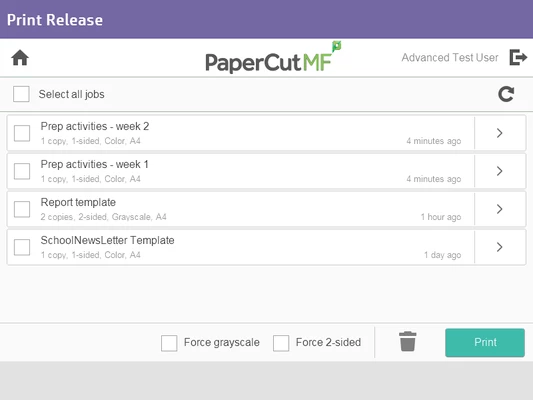 PaperCut validates the user's credentials and releases their jobs to the adjacent printer. The Fast Release TCP/IP Network Convertor enables USB card readers which support a large range of authentication card types, including Mifare, HID, HID iClass, Legic and more. PaperCut's Fast Release Card Reader solution supports Mifare, HID, HID iClass and more card types. PaperCut also offers a software based release station that can be installed on any low-end PC or workstation. It provides a full print release solution (including support for card authentication and Find-Me printing). Software release stations are an effective solution for print rooms. It is a particularly cost-effective solution when spare or unused workstation hardware is used. Find out more about Print Release Stations. Tracking and control of printing, copying, scanning and faxing. See the tour. Allow users to recharge credit with cash loaders or online payment gateways. See the tour. Take advantage of 50+ one click reports. See the tour.